Harris Lamb has completed the sale of a Derbyshire industrial building for more than £13 million. The business’ Investment team was instructed by Garner Holdings to market Liniar House, a new-build two-bay warehouse at Denby Business Park, with a net initial yield of 6.75 per cent. A high-specification warehouse extending to 178,073 sq ft, Liniar House is located on the 64-acre Denby Business Park, a design and build scheme and let to HL Plastics Limited, an established supplier to the construction sector. Neil Harris, Director, said: “This was a rare opportunity to purchase a prime, long-let freehold site in a strategic East Midlands location, and as such, attracted a significant amount of interest from UK investors. “HL Plastics, whose headquarters is also located at Denby Business Park, moved into this building upon its completion in February 2017 on a 20-year full repairing and insuring lease. Further to multiple bidders vying for the site, the business invited best and final offers. An undisclosed UK organisation successfully purchased the building, with a sale price in excess of £13m being achieved, resulting in a lower net initial yield of 5.9 per cent. Justin Marshall added: “The value of this sale wasn’t simply dictated by the tenant’s strong covenant and the longevity of the lease, but also by the long-term development forecast for the site and surrounding area. “Located within a major manufacturing and logistics hub with first class UK access links, Denby Hall Business Park is destined for further development, with planning consent for a further 240,634 sq ft of industrial space having been secured. 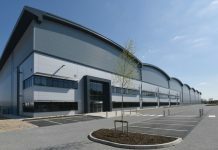 “Widespread industrial development is earmarked for the surrounding areas, including Castlewood Business Park at J28 M1 where 96 acres has consent for production and distribution uses, and Derby Commercial Park, a 180-acre scheme to accommodate units from 97,000 to 700,000 sq ft, with Ted Baker and Kuehne + Nagel already committed,” he said. “Other major occupiers in the area include Kuehne & Nagel Ltd, Arcadia Group Ltd, The Cooperative, DMW Logistics, UDG, Eurocell, Rolls Royce, Midland Aerospace Pilkington Glass, DEB Group and SIG, clearly cementing the region’s reputation as a national manufacturing and logistics hub and ensuring continued demand for space from occupiers and buyers. “The letting of a further 100,000+ sq ft distribution unit to ockwood Group on Denby Hall Business Park within the last few months is further testament to the strength of the location for occupiers,” added Justin.